Abby was found in the mountains several months ago. She had been nursing puppies, and was horribly under nourished. Abby also suffered from heartworm, which probably explains her abandonment. 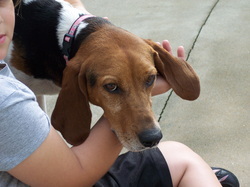 Abby has received her spay, then got well enough to undergo heartworm treatment which will complete the end of August. So Abby is now available for adoption! Abby has been adopted, thank you so very much! Abby and her new Dad are buds. She cares for him a great deal, and he dotes on her. On weekends Abby gets to visit with family, and she adores his child. Abby gets to sleep on the sofa all she wants, life is good!